Do you have any information on the infotainment update? Think Honda would contact us? Everyone should remember, a TSB (Technical Service Bulletin) is NOT a recall. Rather, it is a communication published to aid in resolving service issues. In this case, we should expect any dealership to look up the symptom (battery discharge after parking brake applied during 2+ days of inactivity). Sometimes it is necessary to tell the service writer that Honda knows the issue and it can be corrected or prevented (in this case, through TSB 17-032). THAT is the power of Forums like the CRVOC!!! Exactly correct. Our TSB 17-032 is NOT a recall, but unfortunately some service writers at my dealer remind me of telephone customer service reps that only know what they read off a script. 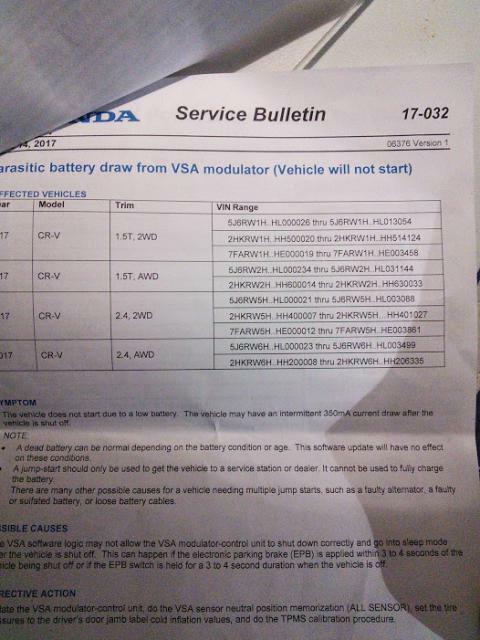 I had a messy phone conversation where a service writer told me I would have to pay a diagnostic charge related to this battery-no start issue. Currently, I have contacted Honda, and have a case # assigned. I expect to hear from Honda rep for my area next week. I have had two dead battery events since May after car sat for 3-4 days with parking brake engaged. Recently I've not used parking brake, but I prefer to use it. My battery was dead after sitting for 3 days. I took my vehicle to the dealer and told them about this service bulletin. As reported by others in other threads, they couldn't find a bulletin 17-032. They did do an update on my vsa software. I don't know how updates to this system work. I would hope an update to this system would be inclusive. Certainly they don't have to do updates for each tweak or fix that comes along. My battery continued to lose voltage after the update, so I went back to the dealer. They told me the battery was bad and replaced it. This morning the new battery had a full charge according to my meter but the parking brake was not engaged. I'll check it tomorrow after the parking brake has been on. That will be the test. I'll check in with an update. If you check your battery with a multimeter you can see what's going on instead of waiting for your battery to be dead at the worst possible time. Mine went to 11.9 volts after 3 days which is nearly dead but started the car. If it were 10 degrees, probably not. My next move is also to contact Honda. My dealer has tried to resolve this but obviously hasn't been given the resources they need. Wow. I am really sorry I bought this stupid car. Should have stuck to toyota.